Planning a wedding, or any event for that matter is so visual. I love tools like Pinterest because we can use them to organize our ideas on a virtual pin board. The bulletin board above my desk at home is covered with post-it notes, magazine cutouts, and photos that inspire me. But only I can see those. One of the other things that I love so much about Pinterest is the ability it gives us to share our inspirations with our friends. For anyone planning a wedding, I would highly recommend using Pinterest as a tool to visually organize your ideas. Sometimes, it’s hard to explain exactly what we want. So many times have I gone to a salon to have my hair styled and walked out with something totally different, not what I wanted! 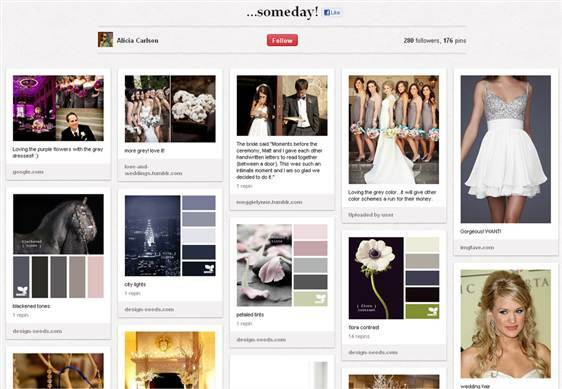 Using Pinterest, you can show your wedding planner, your florist, and your hair stylist exactly what you want. If you are in the early stages of planning your wedding, Pinterest is a great tool for inspirational research. Keep up on all of the latest trends in bridal fashion, centerpiece ideas, and venue suggestions. Pinterest has something for every facet of your wedding. If you don’t want to share the ideas you have pinned with anyone, you can use Pinterest’s new Secret Board feature. This will keep all of the images you have pinned on this board private, so only you can see them. Once you find an image you like, pin it by dragging your cursor over the image and selecting “Re-pin.” Select which board you want to put the image on write a comment about it if you wish. (This is great for making notes about where you want to use the idea in your wedding!) Then, click on the red “Pin It” button, and you’re done! Happy planning!